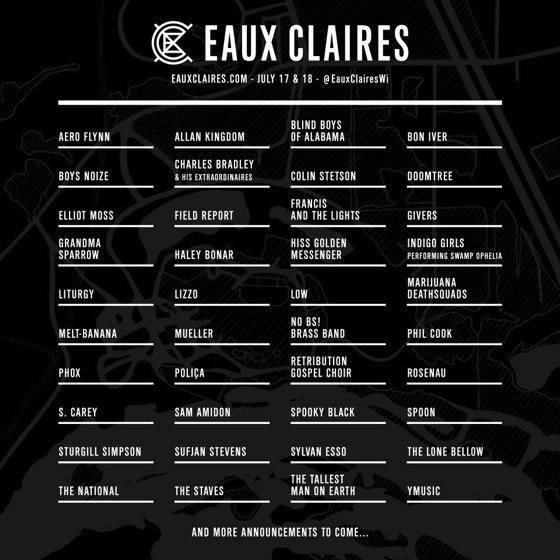 Bon Iver mastermind Justin Vernon recently announced plans to organize a music festival in his hometown of Eau Claire, WI, and the inaugural lineup for the Eaux Claires Music & Arts Festival has now arrived. Co-curated by Vernon and the National's Aaron Dessner, both Bon Iver and the National are slated to take the stage. They've also nabbed Sufjan Stevens, Spoon, Low, Charles Bradley and Colin Stetson for the event. Field Report, Aero Flynn, Indigo Girls, Liturgy, the Staves, the Tallest Man on Earth and Sturgill Simpson have also been confirmed. We at Eaux Claires have been driven by the idea that our festival would encourage music-genre-walls to melt away. That the barriers between the stage and the audience altered, and expression and experience put above all. We have put so much thought into who should collaborate at this festival, from musicians to actors, filmmakers to visual artists. We will all share and revel in this collision of artistic force while performing inthe arms of our own Chippewa River Valley. The festival will take place on July 17 and 18. Ticket information and the complete lineup can be found here. Below, check out the festival's official lineup announcement video, featuring Vernon and Dessner in matching toques.